Let’s just get it out of the way, shall we? 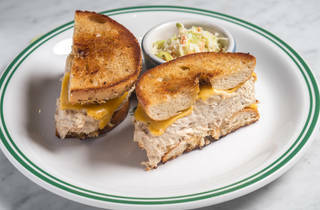 Sadelle’s isn’t home to the best new bagel in New York—that honor goes to Black Seed’s small, crackle-edged Montreal rendition—but it’s easily got one of the city’s best-looking. Ushered out from a revolving-tray oven with a hammy “hot bagels!” bellow and stacked onto oak dowels set above the counter, the glossy, boiled-then-baked rounds (each $2) flicker with salt crystals and caraway seeds, with freckles of poppy and sesame overlaid across the golden exterior. 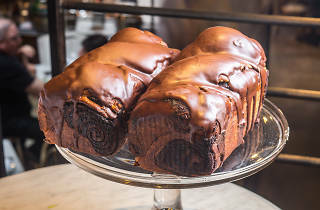 Those burnished beauts are the efforts of Melissa Weller, a former Per Se and Roberta’s baker whose Smorgasburg stall, East River Bread, caught the attention of Major Food Group titans Mario Carbone, Rich Torrisi and Jeff Zalaznick (Carbone, Santina). But beneath their good looks, the dense bagels here lack that delicious give-and-take between sweet and sour, snap and spring—frankly, what they lack is spirit. 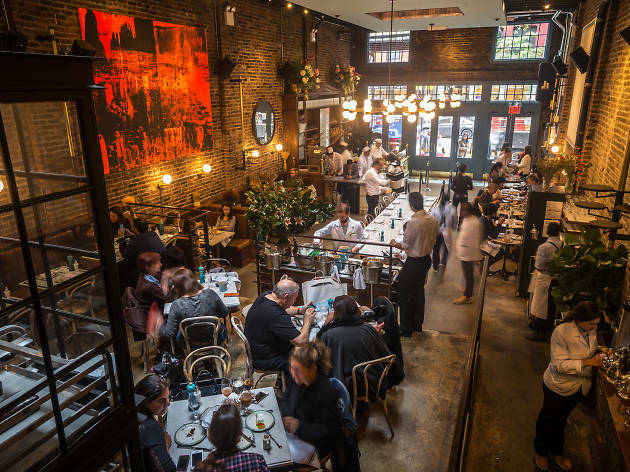 Such is the case with Sadelle’s as a whole, a baroque feast-for- the-eyes stage set of marble countertops, paper-hatted smoked-fish attendants and Billy Joel hits on heavy rotation. It’s like a Jewish dairy that’s been given the ol’ Broadway razzle-dazzle. 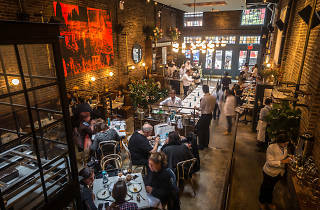 At the front of the brick-walled, three-tiered dining room, you’ll find a takeout deli and bakery turning out Ashkenazic curios like whorled poppy-seed rugelach ($2), chunky whitefish salad ($10 per half pound) and oily ribbons of house-smoked salmon ($11 per quarter pound), whose deep orange hue belies the shallow salinity of the lox. 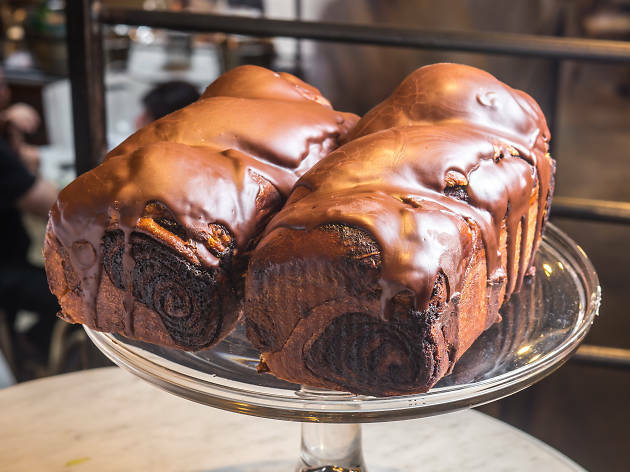 Chocolate babka ($15), too, coasts on its beauty; though generously marbled, its interior is more bready than buttery, weighed down by a thick top coat of ganache. 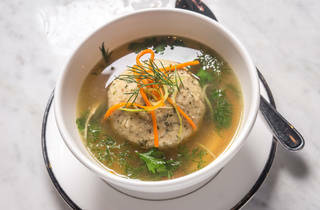 The sit-down area boasts a more extensive menu, with onion-studded egg plates ($21), dilly matzo ball soup ($12) and salad bowls (Waldorf $22, Cobb $22) with ingredients arranged in precise, Instagram-ready columns. 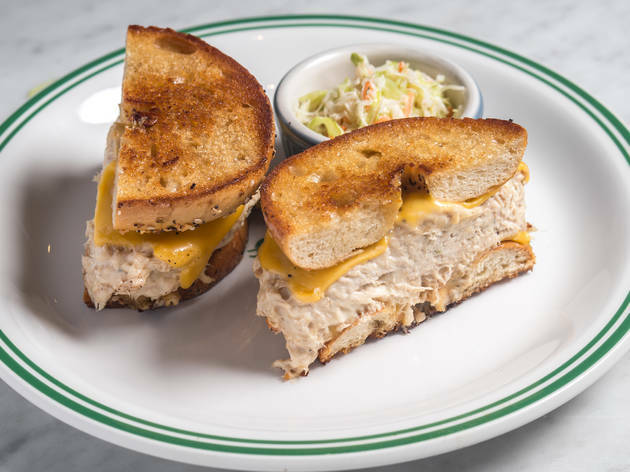 Sandwich standouts include a truly great—if $29—triple-decker, balancing your choice of meat (turkey, ham, roast beef, salami) with tangy, mayo-free cole slaw and smooth Russian dressing on soft caraway rye, and a tuna melt smartly bookending the creamy spread and gooey American cheese between an inverted bagel, so the seeds don’t burn upon toasting. Those touches are nice, but it’s hard to enjoy the extras when Sadelle’s doesn’t get the bagel basics right. 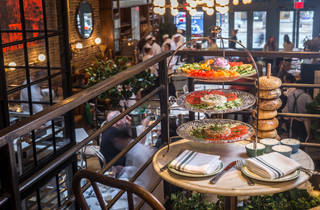 Sadelle's is an experience! This is the place to see and be seen! Definitely expensive, I mean it's a bagel after all, but it is a really good bagel, made in house and the fish is top notch. Make a reservation like 3 weeks in advance or prepare yourself mentally to wait for 3 hours. Great photo ops for your Instagram feed and the whitefish truly is incredible. Love bagels? What about lox and whitefish? 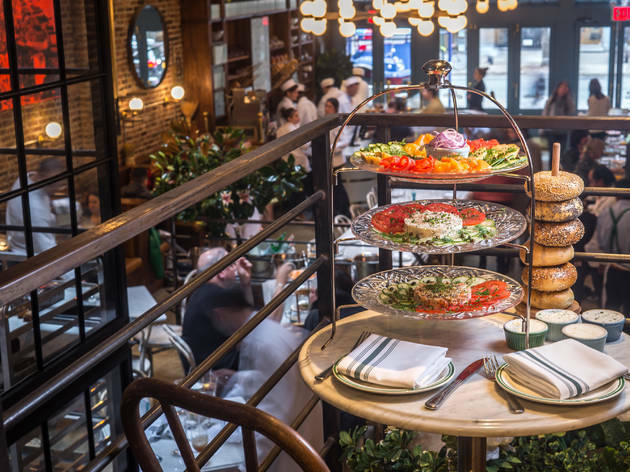 You'll love Sadelle's. 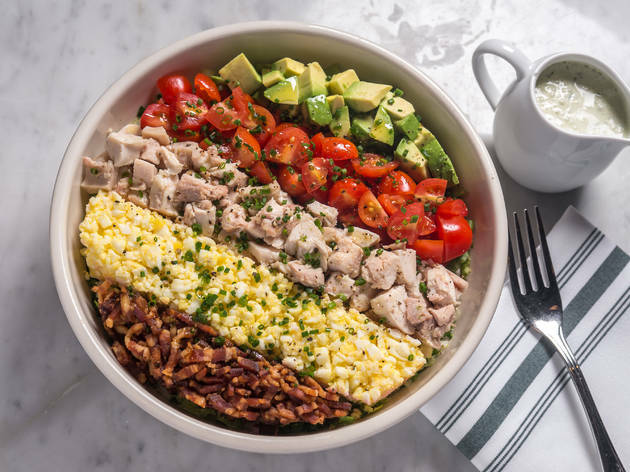 The adorable SoHo spot boasts a plethora of bagel-topping options, including a tower with all of the fixings. It's a little expensive, but the quality of fish is on par with other beloved spots like Baz's. And for anyone who's gluten-free they offer the best tasting alternative bagels in the city. Bonus for IG loves: The bagels are served in tower-form on wooden dowels which makes for a great photo opp. 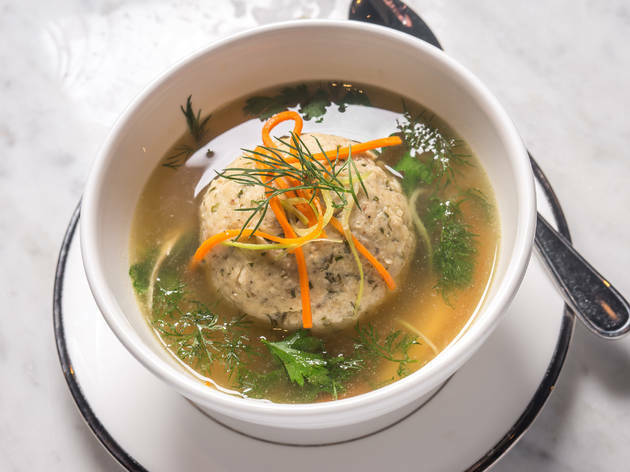 Make a reservation, and you'll be a happy bagel-eater. They serve gluten-free bagels, which is a dream for those with allergies, but the real star is the traditional bagel. Hot out of the oven and walked around on a wooden dowel by a server dressed in an old-school uniform, these are a must. As expected, the smoked salmon is also excellent. 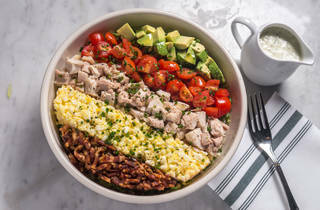 If you're looking for THE trendy brunch place du jour, you've found it. Long waits, incredible bagels, house smoked salmon and the world's best sticky buns. The French toast is also incredible--crispy on the outside and ooey gooey on the inside. Reservations accepted. You can also get lots of goodies to go.